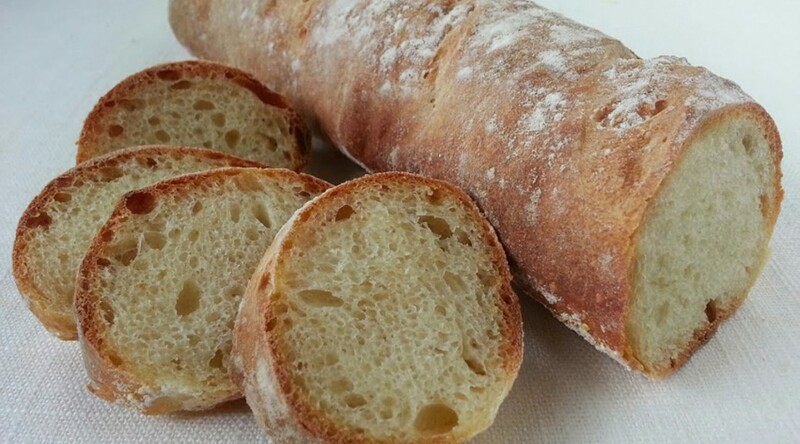 This bread is the Italian cousin of France’s baguette. 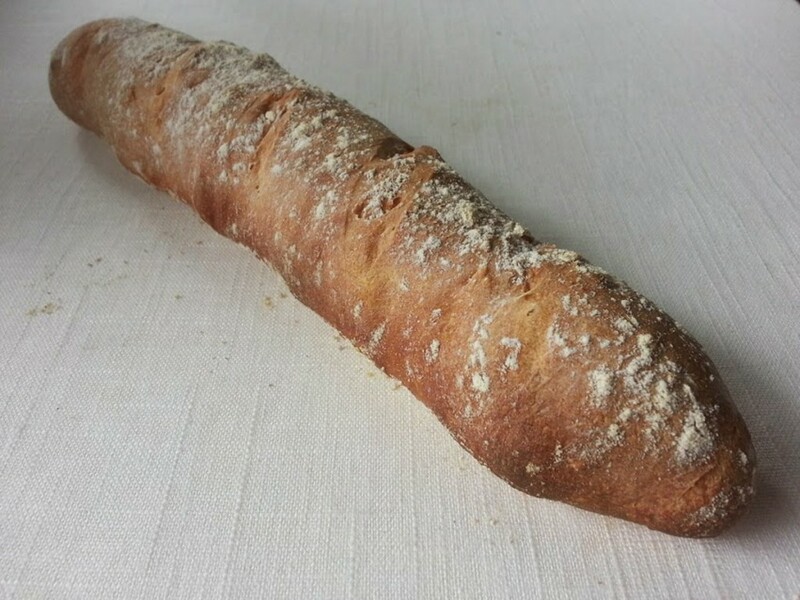 Made with just flour, water, yeast, and salt, it has a light, airy crumb with small air bubbles. Be sure to allow for the overnight rising in the refrigerator, so the bread acquires a deep, rich flavor. Combine the flour with the yeast and sea salt in an 11-cup food processor. Process for 5 seconds. Slowly add 1 and 1/2 cups of room temperature water through the feed tube while the processor is running; the dough should come together, forming a somewhat sticky, smooth ball. Add a little more flour if the dough is wet or a little more water if it is dry. Once the dough forms a ball around the blade of the food processor, process for 45 seconds (do not overprocess or the dough will become too hot and you will compromise the formation of the gluten strands). 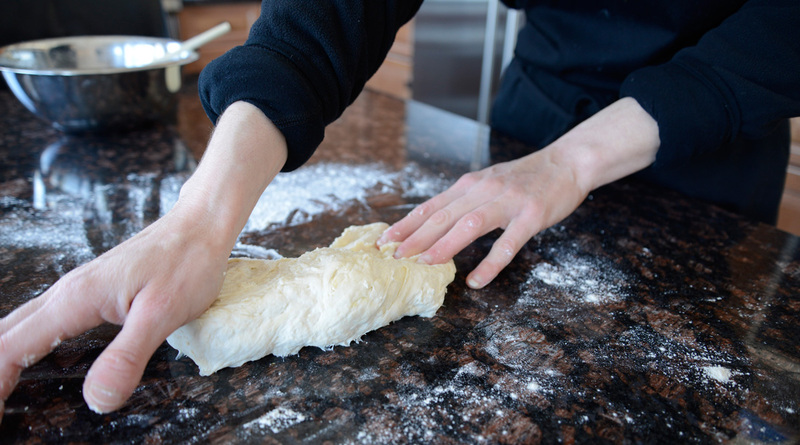 Turn the dough out onto the counter, knead by hand for a few seconds, shape into a ball, and transfer to a lightly oiled bowl; turn it to coat with the oil on all sides. 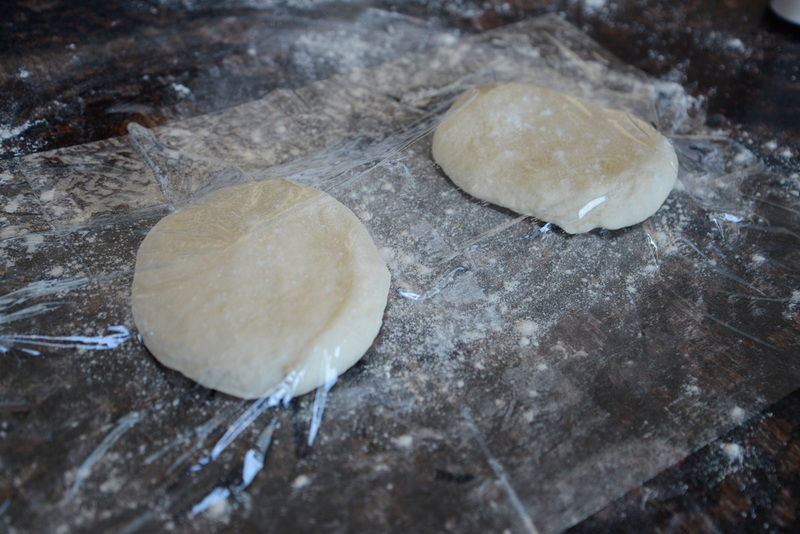 Cover with plastic wrap and let rise at room temperature for 30 minutes, then refrigerate for 24 hours. The dough will double in bulk. When you are ready to bake, return the dough to room temperature. 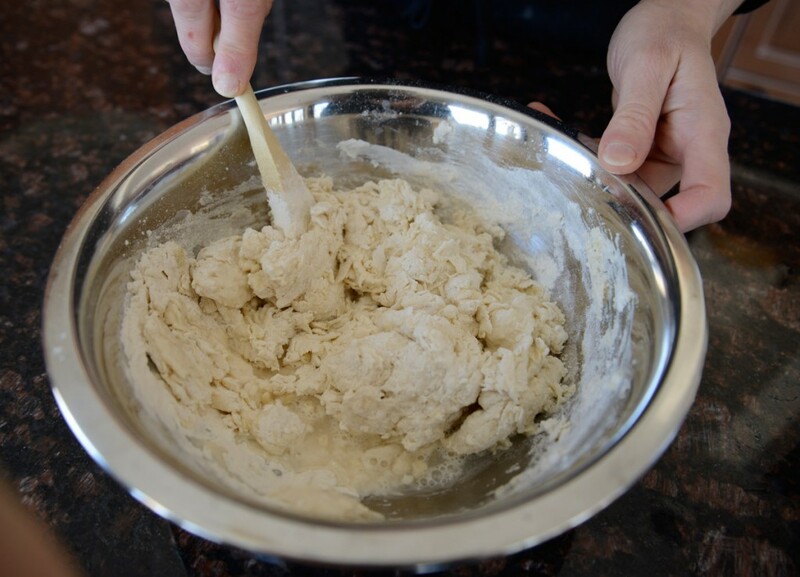 Turn the dough out onto a lightly floured counter. Cut it into 2 equal pieces and shape each into a ball, making sure you don’t press out all the air bubbles that have developed (leaving air bubbles intact ensures a lighter texture once the bread is baked). Cover with a towel and let rest for 15 minutes. Meanwhile, preheat the oven with a baking stone in it to 450 degrees (preferably set on convection). Pat 1 ball of dough into a flat 1-inch high rectangle measuring about 4 inches x 5 inches. Fold the side furthest from you over toward you and seal the seam using the heel of your hand. Turn the rectangle 180 degrees, and fold the side furthest from you over toward you; seal the seam using the heel of your hand. Fold the resulting log in half lengthwise, sealing the edges with your fingertips. Roll into a 14-inch-long cylinder with slightly tapering ends. Repeat with the remaining ball of dough. Cover with a towel and set aside to rise at room temperature for 1 hour, or until doubled in size. Slash each cylinder diagonally at 3-inch intervals with a razor blade. Sprinkle lightly with flour. Place on a baking peel that has been sprinkled with the cornmeal; slide onto the baking stone. If you don’t have a baking peel, place the loaves on a reversed baking sheet sprinkled with cornmeal and slide them into the oven. Be sure to leave plenty of space between the loaves as they will double in the oven. Lower the oven temperature to 425 degrees (preferably set on convection). Cool the bread on a rack and serve at room temperature; alternately, freeze the bread in plastic freezer bags for up to 2 weeks and reheat for 10 minutes in a preheated 350 degree oven. This is quintessential street food in Liguria: thin, flaky dough encasing runny cheese, the whole thing flavored with fragrant olive oil and coarse sea salt. A specialty of Recco, a small seaside town, focaccia di Recco is unlike any focaccia you may have encountered. There is no yeast in the dough, and no salt in the dough either (salt toughens the dough, so it is used only on the top crust, sprinkled on just before baking). 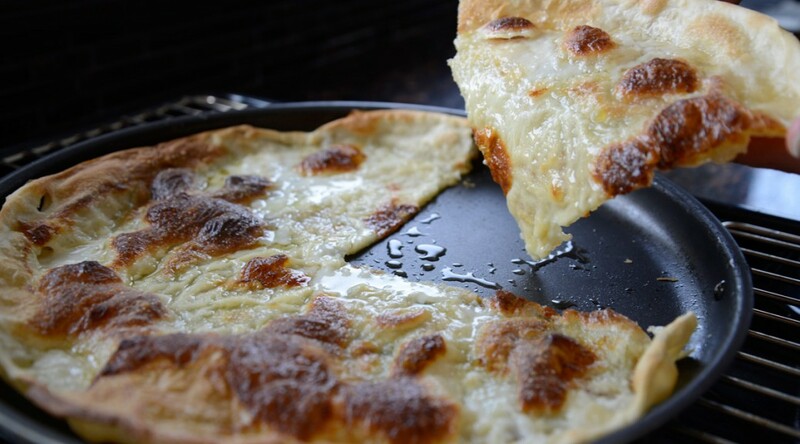 The focaccia is baked in huge pans in a blazing hot oven, the top crust emerging burnished and brown, the bottom crust soft and almost lasagna-like thanks to the weight of the cheese. And the cheese: Stracchino or Crescenza are the only cheeses used, runny, tangy cousins of Gorgonzola, but with no hint of blue and no aging. 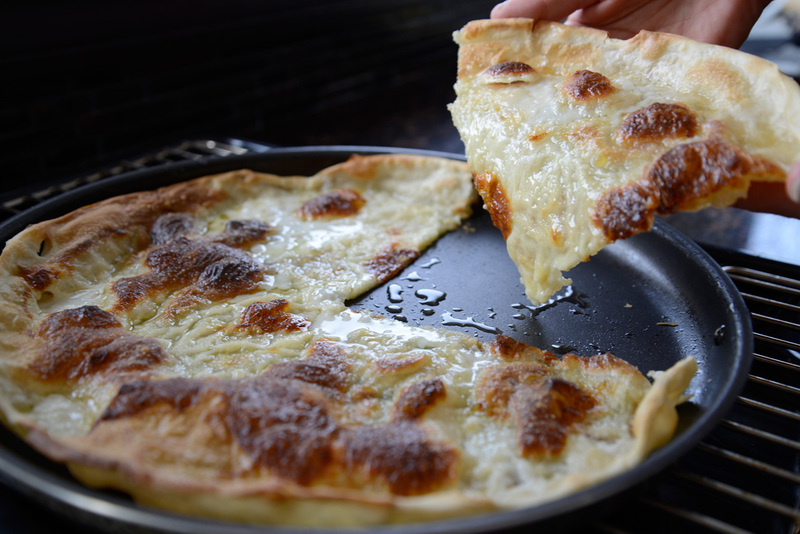 Almost impossible to find in most American cheese shops, Stracchino and Crescenza can be substituted by Taleggio or even a buffalo milk Mozzarella, and the resulting focaccia will be delicious… but not quite the same as the original. You can mail-order Stracchino from igourmetcom . We met Luigi Guffanti in Piedmont, when we visited with my parents on the Lago Maggiore, and his cheeses are delicious!! 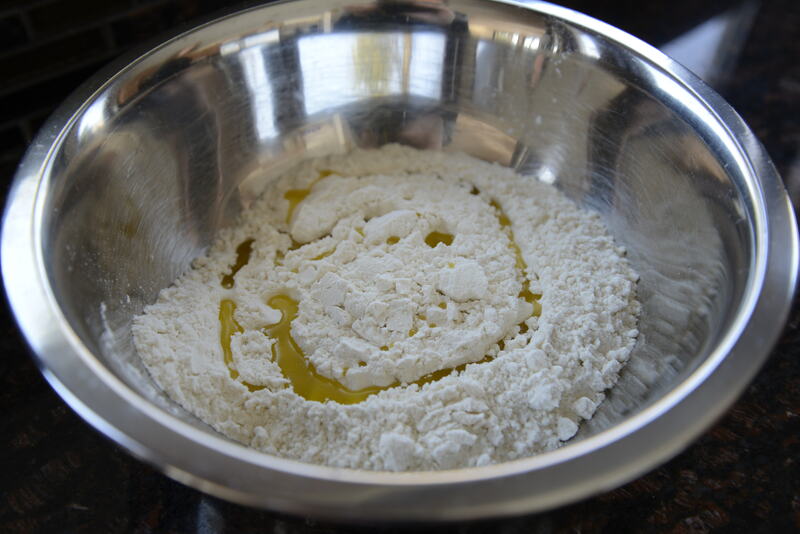 Make the dough: Place the flour the olive oil in a bowl. Add ½ cup plus 2 tablespoons of room-temperature water and stir with a wooden spoon until the dough comes together. 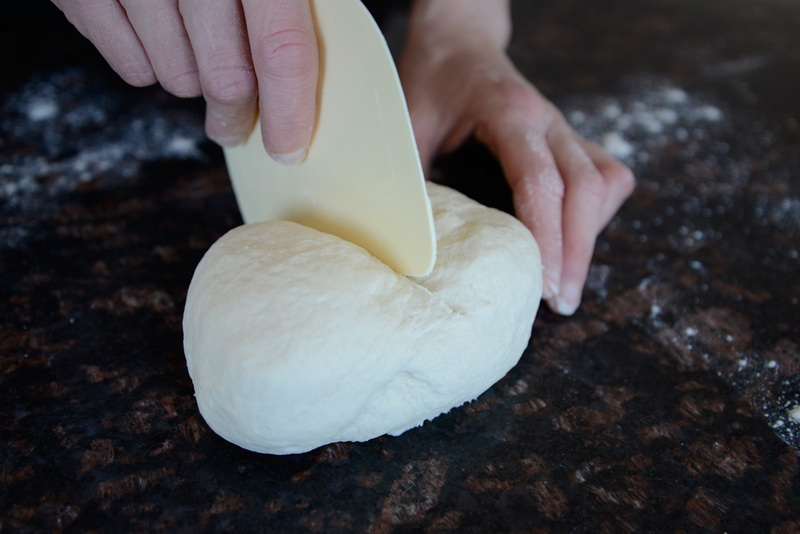 Turn out onto the counter and knead for 5 minutes, adding water if the dough is dry or flour if the dough is sticky. 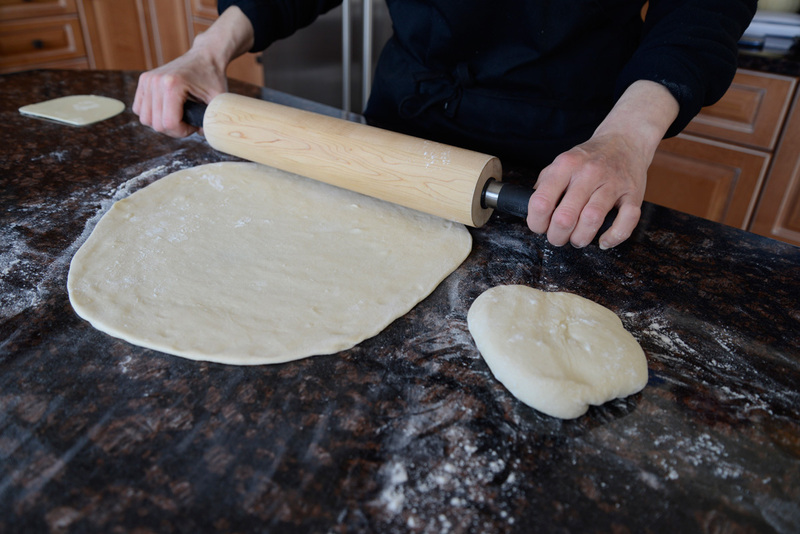 The dough should be soft and supple, or you will not be able to roll it out until it is nearly transparent later; resist the temptation to add too much flour or it may be tough later. Turn the dough out into an oiled bowl, shape into a ball, and wrap. Let rest 30 minutes at room temperature (or refrigerate up to 2 days; return to room temperature before rolling out). Meanwhile, preheat the oven with a baking stone in it to 550°. Cut the dough in 2 pieces and shape each into a ball. Cover and set aside 20 minutes to relax. Roll out both pieces on a lightly floured counter until quite thin and allow to rest on a floured counter for 5 minutes to relax and make stretching easier. Make sure there is some flour under the dough or the dough will stick to the counter. Generously oil a round 14-inch pizza pan (use about 1 tablespoon: don’t be skimpy with the oil or the texture of the focaccia won’t be right) and line it with 1 piece of dough, allowing excess dough to hang over the sides (there should be at least 1 inch of excess dough on all sides). 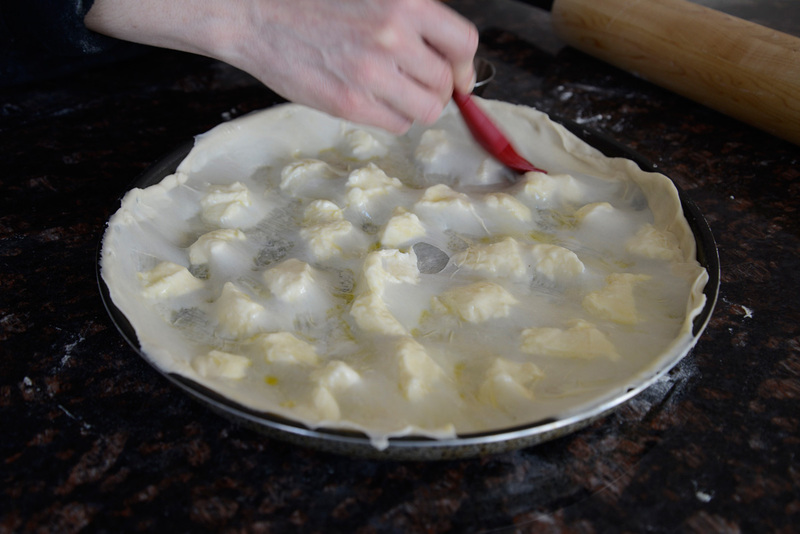 Scatter the Stracchino over the dough, then cover with the other piece of dough. 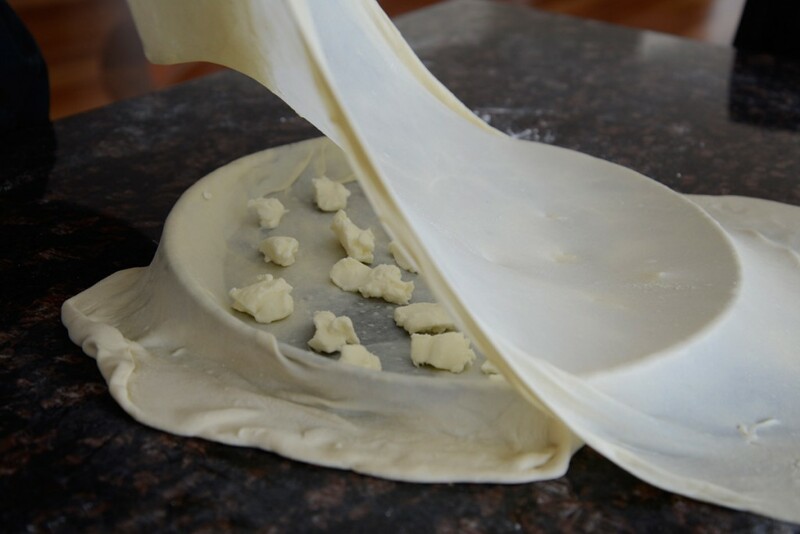 Press the edges to seal and run the rolling pin over the edge of the pan to cut off excess dough, then seal again. 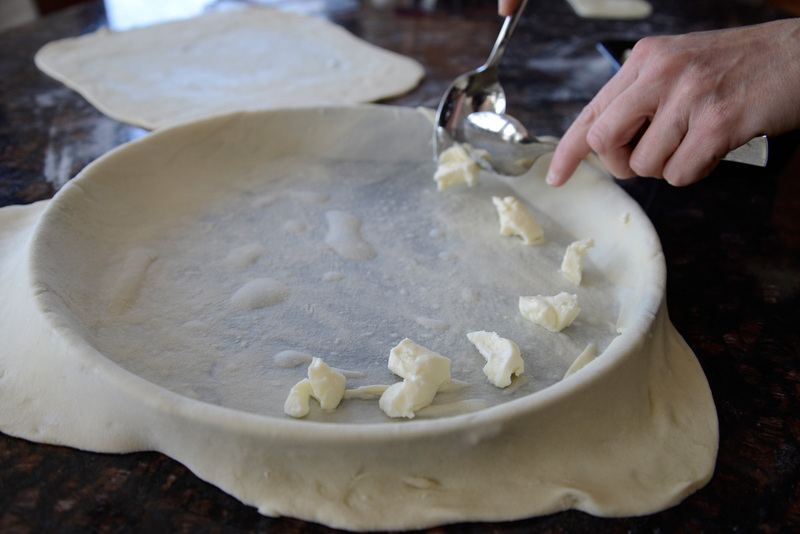 (Excess dough can be refrigerated for up to 2 days, covered, and used to make other focaccias; you can also freeze it for up to 1 month and defrost as needed). 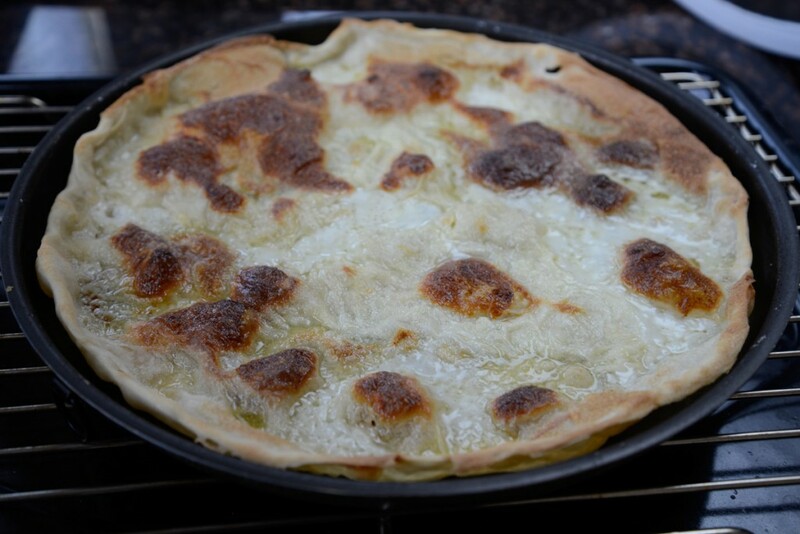 To bake: Brush the top of the focaccia with the olive oil and sprinkle it with the salt. 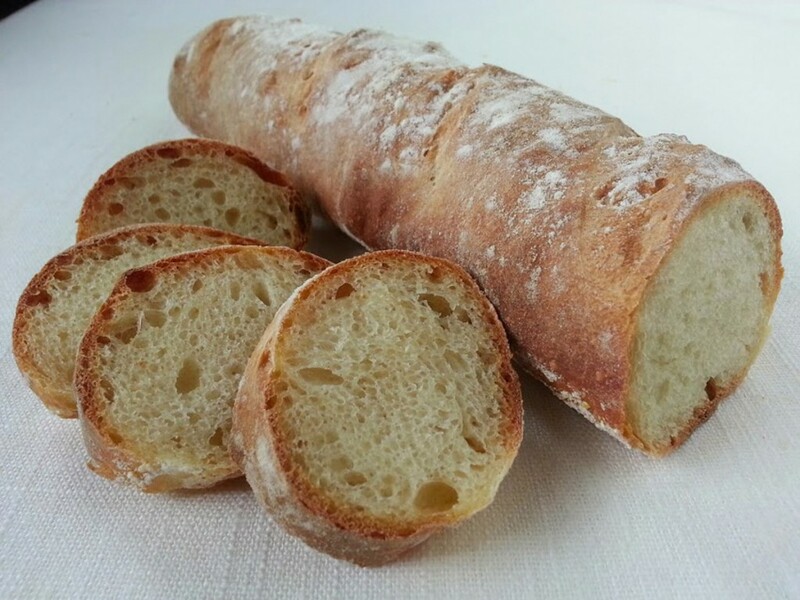 Make a few small tears in the top of the dough (this allows air to escape, preventing the dough from doming as a result of accumulated steam as the focaccia bakes) and bake on the baking stone in the preheated 550° oven for 7 minutes, or until the dough is lightly golden and puffed with a few brown spots. You do not want the dough to take on a cracker-like texture. Serve piping hot.